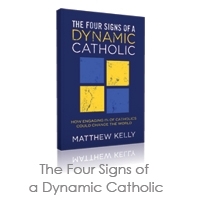 Matthew Kelly’s “Rediscover Catholicism” was a turning point for me in my journey to Catholicism. I love the way he explains Catholicism and makes it relevant to my life today. Here is a quote I highlighted in his latest book “The Four Signs of a Dynamic Catholic” (which you can get for FREE on his website at www.dynamiccatholic.com), which encourages Catholics to get involved and make a difference in our world. Last summer as I continued to explore my new found interest in Catholicism, I decided that I wanted to take a quiet 1-day retreat to get away from technology, which I am always connected to due to the nature of my work, and spend quiet time reading, reflecting and trying to discern what God would have me do. My husband and I had attended our Pre-Cana Catholic marital retreat 13 years ago at a lovely retreat house in Indianapolis and I knew that’s where I wanted to go. I had fond memories of our time there, especially the quiet and calm, something I’ve rarely, if ever, been able to replicate. No TVs, no music, no technology. Only yourself and God. The Fatima Retreat House offers days of silence for a very small fee where you can spend a day on their grounds, which are lovely, and facilities, using their library, walking the labyrinth, wandering the woods, praying in the chapel and sitting in stillness. You can also choose to spend one night for a nominal fee, as well, which I decided to do. The retreat was incredibly refreshing for me. I tried to keep talking to a minimum and observe true silence, checking my phone only to see if I’d had any emergency calls. I spent my time reading, walking, praying and meditating. Browsing their library, I found a book that interested me on monasteries, which helped set further my interest in St. Benedict and his rule for monasteries. I prayed that God would give me some direction in my life for how I could make it more righteous and spiritual. 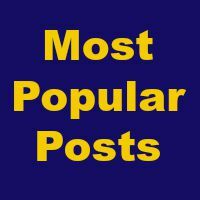 While sitting in the woods in silence, the idea for this blog was given to me. It’s amazing how simply being quiet allows you to hear God and how hard that can be for some of us. God’s help doesn’t necessarily come right away or when you expect it, but if you wait with an open mind and heart, you just might get some guidance. With kids and pets at home and work beckoning, it’s much more challenging for me to find, or even take, some quiet time to myself. I feel the stress of what I need to get done at home, but sitting at the retreat, everyone knew I was “off duty” and I could really focus on the spiritual. I have not gone back for another retreat yet, but I definitely want to go again soon for another refreshment of spirit and time spent with God. 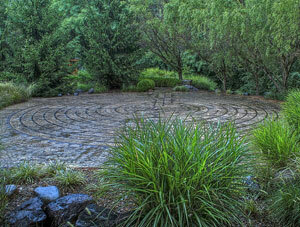 Have you taken a religious or spiritual retreat? Tell me about your experience. I’d love to hear more perspectives! Let’s see yesterday it was … the kids, my husband, even my cat… As much as I desperately want to carve out some holy QUIET, quiet being a key word :), time to myself it is so difficult. I am attempting to pray the Liturgy of the Hours, something monks and nuns do as well as deacons and some others. The Liturgy of the Hours is a series of prayers that incorporate the Psalms and are said at the same times throughout the day (for the full version, seven times a day). 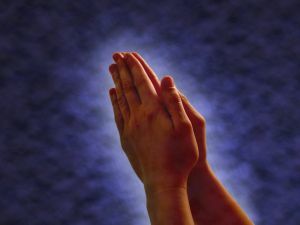 I’ve made it a goal to pray first thing upon waking, 9 a.m. or right after I get the kids to school, Noon and before bed. I work in 3 p.m. when I can. The as-soon-as-I-get-up-one has been the most challenging as have been the prayers on days when school is out like Labor Day yesterday. I go to our bedroom or the guest bedroom and shut the door, but it’s hard to concentrate with kids playing rambunctiously downstairs or your cat rubbing up against you as you kneel in prayer. I suppose it’s better than not praying, but I get frustrated at my inability to focus on the words due to lack of quiet. It’s hard enough to focus on the words and really try to take in their meaning when it actually is quiet. With any distraction, it feels hopeless. So what is the answer when I desire so much, “thirst,” in fact, to use the verb often used to describe spiritual longing, for as much prayer and spiritual reading time as I can find? But yet live the life of a lay person, a mother, a wife, a business owner, a cat owner J? I prayed about it this morning in front of the Blessed Sacrament to Mary and this is what came to me in response. First of all, I am carrying out the work of God as a mother. Wasn’t that Mary’s call? To raise the son of God? So time spent there is doing God’s work in itself. But, also, I found encouragement to wake early, before the house does (even the cat! ), where I can enjoy an hour of solitude. Quiet reading. Prayer. Silent meditation. Even 6:30 a.m. mass. I’ve been working on this morning thing for a while now but it’s a struggle for me. It’s not that I’m a night person, but just that I’m not really a morning person either. But as I cannot seem to find a way to fit it all in to my spiritual satisfaction otherwise, I am going to take Mary’s advice and pray to be awakened early with vitality (at least enough to get out of bed) and the anticipation of what lies before me if I do put those feet on the floor and stand myself up. I’ve also instituted an hour of quiet on the weekends for my whole family to encourage everyone to understand and value “silence” in this noisy world. I even encourage “no words” for that hour, especially challenging for a 4-year-old who wants to verbalize his every thought. But silence can be powerful and I want them to realize that as they grow up. Have you struggled to find time for quiet prayer amid life as a mother and wife or father and husband? What has been your solution?